I don't know about you, but when I think of cornbread that crumbly, dense, sometimes-cooked-in-a-skillet version comes to mind, you know, the kind of cornbread that comes from that little blue and white box? I like serving cornbread with chilis and hearty soups, but was looking for something a little different this past week and found a recipe for cornbread that included yeast. 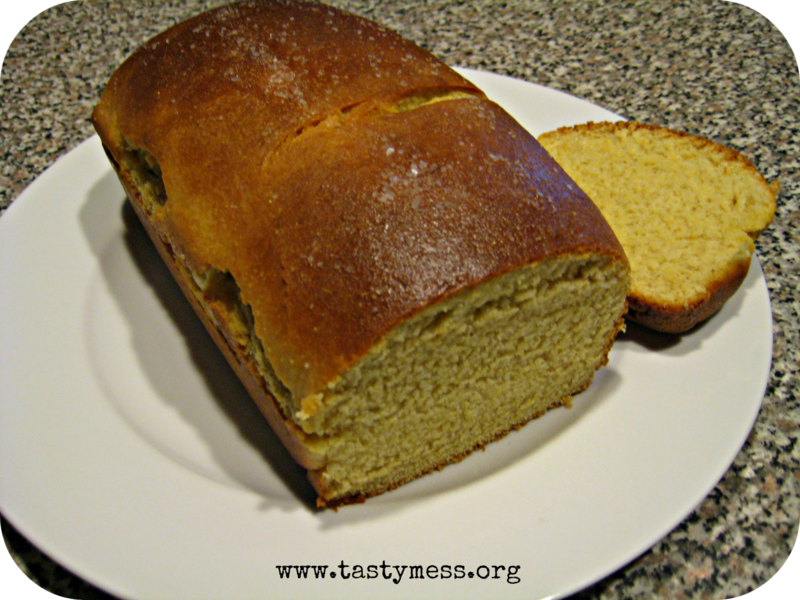 I had never seen a cornbread that rose like a loaf-style bread and was intrigued enough to give it a try. I love the flavor of cornbread and honey that comes through in this simple loaf of bread and the lightness the yeast and AP flour give it is amazing. Definitely worth giving a try and serving up alongside a veggie chili or soup! Warm 3 tbsp. of the butter with the honey and milk in a small saucepan over medium-low heat. Stir occasionally and heat just until the butter has melted and the mixture is smooth. Remove from heat and let sit for a few minutes to cool - it should be at about 120 degrees before using. Meanwhile, combine the cornmeal, 1 1/2 cups of the flour, salt and yeast in the bowl of a stand mixer. Add in the milk mixture and stir until well combined. Swap the mixer attachment to a dough hook and began slowly adding in the rest of the flour - about 1/2 a cup at a time - until you get a slightly sticky dough that balls up around the dough hook rather than stick to the bowl. Knead for about 5 minutes after you get the dough to that point. Remove the dough and place it in a lightly greased bowl, covering it lightly with plastic wrap or a clean dishtowel, and allow it to rise until doubled (about an hour). Gently punch the dough down and knead a few times, then let it rest for 5 minutes or so while you prepare your loaf pan. Lightly grease a 9x5 glass loaf pan and set it aside. Roll out the dough on a clean surface until its a large rectangle (about 8" wide). Then roll up the dough and place seam-side down in the loaf pan, folding in the ends. Cover the loaf again and let it rise for 30 minutes while you preheat the oven to 375. Bake the bread until the top is nice and golden (about 40-45 mintues). Brush with melted butter while still hot and sprinkle lightly with kosher salt. Serve warm. This bread only stays fresh for about 2 days, so be sure to store it in an airtight container at room temperature and eat right away!